Hugo’s Amazing Tape was created as a result of a mistake, according to inventor Hugo Maisnik. As the owner of a display-printing business in Los Angeles, Maisnik had produced a material that did not work for the intended purpose. Because he had invested $20,000 in its production, he was reluctant to just throw it away. Being an inventor at heart, he tinkered with the material and realized it had some unusual qualities that would make an excellent, multi-purpose tape useful in hundreds of ways and in a variety of settings. Maisnik premiered Hugo’s Amazing Tape at the 2002 INPEX convention, the largest trade show and investors conference in the United States. That year, Art Fry, of Post-it-Note fame, was the keynote speaker. He noted the similarities between Amazing Tape and Post-it-Notes, helping to further the already positive interest in the tape. Maisnik received numerous offers from retailers, but preferred to continue on his own and see if he could be successful without corporate backing. Selling the product on-line and at trade shows, by 2014 Maisnik or his distributors were attending trade shows in 30 cities around the U.S. every year. In August of 2014, Amazon included Hugo’s Amazing Tape in their “Movers and Shakers” listing. Some of the uses for this versatile tape include bundling wires and cords, garden hose repair, and temporary plumbing repair (not recommended for pressurized lines, however); temporary repair of radiator and air hoses or air conditioning lines in automobiles or RVs; and in quilting to hold fabrics in place or keep thread and yarn from unraveling. 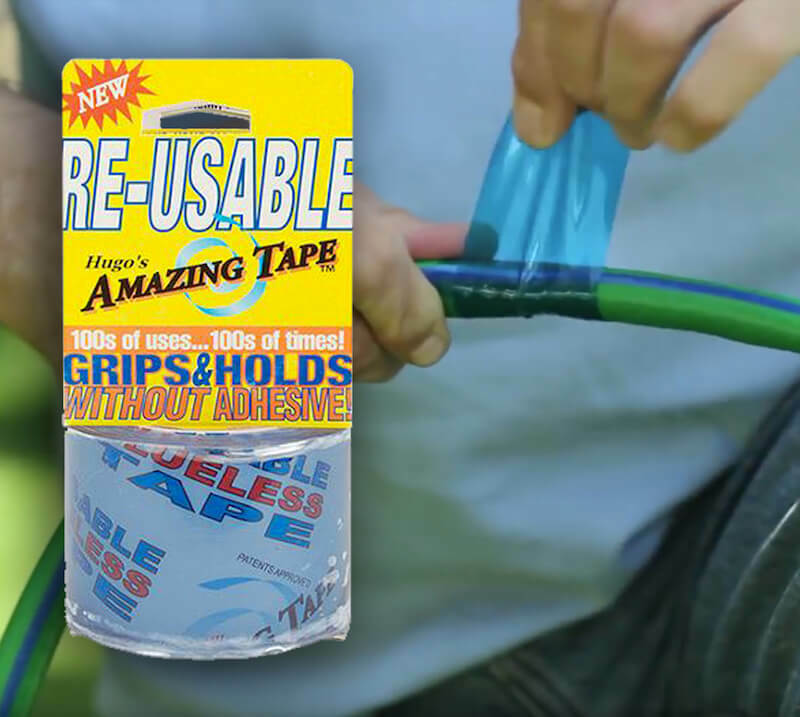 Amazing Tape is self-clinging, free of glue, holds tighter than duct tape, is removable without damage and is reusable. It is possible to write on the tape, making it useful in storing food or other items. It is heat resistant, but can withstand freezing temperatures as well. The tape is clear and comes in rolls of 50 feet in length and either 1” or 2” in width. Maisnik’s experience with Hugo’s Amazing Tape is summed up in his statement “What started out as an accident became an opportunity.” Keeping this possibility in mind is the mark of all true inventors and entrepreneurs.